Carlo filled a container with water using two taps. He turned on Tap A first and after 4 minutes, he also turned on Tap B. Both taps were turned off at the same time when the container was completely filled without overflowing. 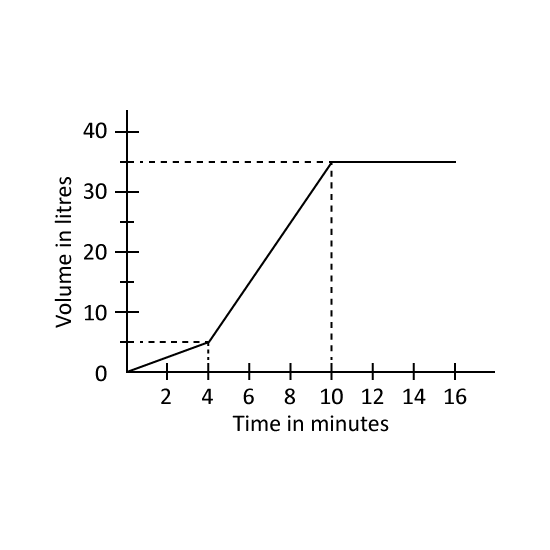 The graph shows the amount of water in the container over 16 minutes. What fraction of the container was filled 4 minutes after Tap A was turned on? Express your answer in the simplest form. In one minute, how many litres of water flowed from Tap B? Annie baked a cake and gave 14 of it to her neighbour. She cut the remainder equally into 5 slices. What fraction of the whole cake was each slice? This figure is not drawn to scale. It is made up of 3 squares. The ratio of the area of the smallest square to the largest square is 2 : 9 while the shaded area is 37 of the unshaded area. What is the ratio of the shaded area to the area of the smallest square? Andy and Ben shared the total cost of a present. Andy paid $15 more than 38 of the cost of the present. Ben paid $25. How much did the present cost? A race car travelled 25 of its journey at an average speed of 64 km/h. Find its average speed for the remaining 480 km if its average speed for the whole journey was 80 km/h. A motorist travelled 23 of his journey at an average speed of 80 km/h and completed the remaining 240 km in 4 h. What was the total time taken for the whole journey?